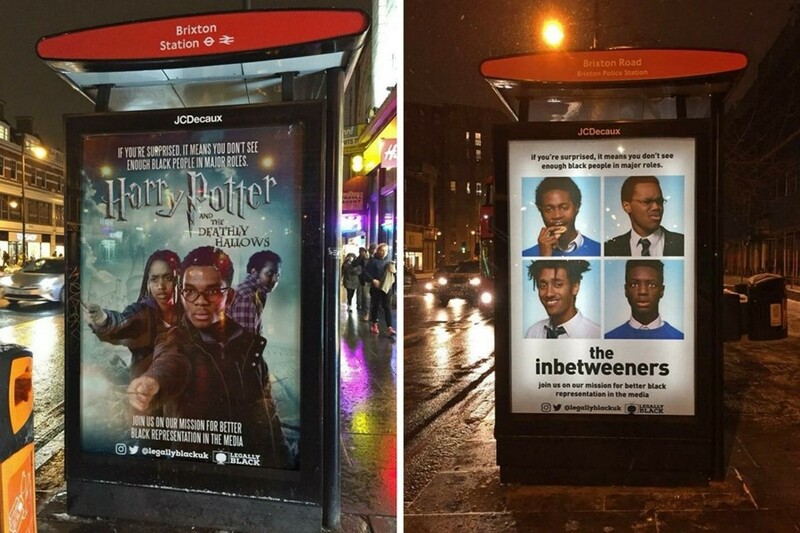 Four teenagers have caused a stir this week after mock-up movie posters they made, replacing white actors with black people, popped up around Brixton in south west London. The teens, who have formed a campaign group called Legally Black, were keen to highlight the ongoing issue of representation in cinema. They appear to have achieved their aim: the images have gone viral on Twitter and the public are having renewed conversations about diversity in the film industry. Black actors portraying black characters in movie and TV has been an issue raging quietly for years, peaking at specific, seminal moments. When Noma Dumezweni was cast as Hermione for the West End version of Harry Potter, there was uproar. Rumours that Idris Elba was in the running for the next James Bond drew a similar reaction. There was also the Star Wars poster that ran in China which shrank John Boyega’s character down to less than half of its size on the British posters. And just this week, older Oscars Academy members labelled the chronically snubbed yet clearly worthy movie Get Out as “not an Oscars movie” – despite many of them having not even seen it. Hope finally came through, however, in the form of Black Panther, which has broken box office records and taken over $800 million worldwide. As Reni Eddo-Lodge, author of Why I’m No Longer Talking To White People About Race said on Twitter, “I never want to hear white gatekeepers say 'there isn't a market' ever again”. I spoke with 18-year-old Liv Francis-Cornibert, one-quarter of the Legally Black movement, about how the posters she designed with three friends in a workshop ended up across Brixton this week. This all began because of the Advocacy Academy, a social justice fellowship in South London, right? Liv Francis-Cornibert: Yes! It began with a 10-day residential called the School of Justice. It was the most intense thing I’ve ever done. The first seven days were dedicated to theory, then on day eight, we were put into groups with other members of the cohort who had similar passions. My group was focused on the representation of black people in the media. It was in this group that I met Shiden Tekle, who is 18 like me, and Bel Matos da Costa and Kofi Asante, who are both 17. Together we wrote a speech, and on the last day we went to Parliament and made the speech to MP Helen Hayes and Lord Hastings. That was September 4 2017, so I guess that’s the day that Legally Black was conceived. So how did the posters around Brixton last week come about? Liv Francis-Cornibert: The residential was just the start. Since then we’ve done 300 hours of further residential and workshops on intense activism and how to make change. In October, Bels came up with the name – it’s a play on the movie title Legally Blonde. People presume it has a far more political meaning than that – it doesn’t! We then began making our posters. In the end we settled on immediately recognisable films and TV shows, like Titanic and the Inbetweeners. We had so much support from people. Doctor Who is one of Kofi’s mum's friends and James Bond is Shiden’s Dad! Once the posters were done, we put them on our website and tried to get them on the side of London buses, but had no luck. Thursday was our graduation from the Academy, though, and as a surprise, the adhacking Special Patrol Group – who we’d done a workshop with previously – had them put up on seven bus shelters around Brixton. Shiden had somebody come up to him at school and ask him if he was in a new Inbetweeners! What is the message behind the posters? Liv Francis-Cornibert: Some people have assumed that we’re advocating for the removal or replacement of white people from film, but the posters are satirical! We’re not saying that you shouldn't celebrate white actors or white films, but we do want to see inclusivity across the board. Black actors shouldn’t just be in movies to fill a quota or for tokenism. We care about the representation of all people of colour in the media and we’re challenging the idea of white people in movies and TV being ‘the norm’. We need more shows with black storylines that are written and directed by black people. We also need black directors and actors so that they can point out when something is wrong, inaccurate or insensitive. It’s great to see that America is making waves; they’ve had movies like Moonlight, Fences and Get Out. Daniel Kaluuya is doing amazing, I love him – but why should he have to go to America to see success? How do you feel about Oscars academy members deeming Get Out as ‘not an Oscars movie’? Liv Francis-Cornibert: Just because something doesn’t fit into the old idea of what is an Oscar film is ridiculous. Part of the reason why we love these new and revolutionary films is because they’re including narratives and characters that wouldn’t have even been touched upon before. So these people are basically saying that all of these elements and characteristics and achievements that are so important to us are not worthy either, and not in line with what is to be celebrated. Jordan Peele invented a new genre of movie. How could that not be worthy of an Oscar? Photos of the posters went viral on Twitter. How has the response been? Liv Francis-Cornibert: Some of the reactions have been amazing. Diane Abbott posted a photo of Shiden and I on BBC Breakfast. I think she is an incredible woman, especially when talking about the treatment and presentation of black people in the media. We’ve also had comments come from people who haven’t actually read about what the posters are trying to say and do, and so don’t understand. One of the most ridiculous comments I’ve seen was that 12 Years A Slave should be remade with white actors. 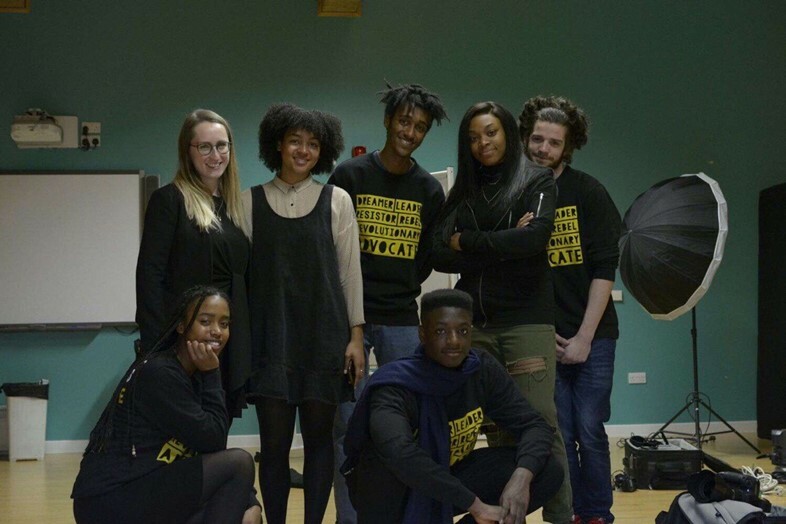 What’s next for Legally Black UK, and for you? Liv Francis-Cornibert: All of the posters have been taken down already, but they’ll be displayed again at Battersea Arts Centre in April, which we’re so excited about. I’ve got a conditional offer to study English Literature at Cambridge, so hopefully, that’s where I’m headed next.